08/28/2017 — AgTech is increasingly being used to help solve complex problems in agriculture to meet the needs of our modern, high-tech food system. To keep up with these challenges, companies seek employees with backgrounds in agriculture and information technology. And, with a high demand, plenty of career opportunities exist for farm kids with an interest in technology, or computer geeks with an interest in agriculture. The AgTech field is extensive and has huge growth potential. Using information technology, companies are trying to solve problems in the agricultural supply chain and to improve agricultural data management. Robotics and sensors are being used to optimize crop performance, effectively manage water, and to improve livestock health. Agribusiness managers use computers to track data and conduct business through word processing, spreadsheets, online applications, precision agriculture software, financial services software, and recordkeeping databases. Many universities with programs in Agricultural and Biosystems Engineering also have degree programs in Agribusiness, Computer Science, and Information Technology. Coursework in multiple degree programs can be taken as electives, or students may choose a related minor or double major, depending on each school’s requirements and opportunities. Many universities, especially large land-grant institutions, offer students work study or internship programs related to their chosen fields. 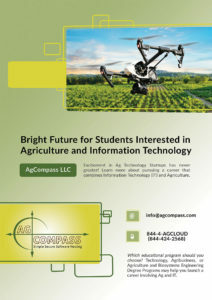 To download the free guide, “Bright Future for Students Interested in Agriculture and Information Technology,” go to agcompass.com/agit. There, visitors can also learn more about AgCompass, a software hosting company for agribusinesses and CPA firms. AgCompass is dedicated to helping small businesses succeed and provides a free newsletter, blog posts, and other content related to managing electronic data more efficiently. The IT staff at AgCompass share a background in agriculture and they provide unlimited, U.S.-based support to clients. 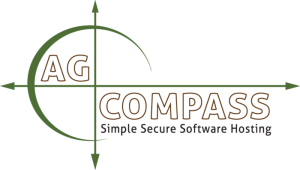 The advantage of hosting your software with AgCompass is that they provide all of the software updates, conduct daily backups, and your data is stored in a world-class data center making it less vulnerable to hardware failure. AgCompass can host any windows-based software including QuickBooks, FBS, RedWing, Microsoft products, and many more. To schedule a free consultation and demonstration, call 844-4-AGCLOUD.